* Blade comes COMPLETE, with all Mechanical Linkage for 3-Way Adjustments, Quick Hitch Adapter Pins and a Heavy Duty Parking Stand! * This Heavy Duty Bison Blade Weighs 1240lb's! * (RH) 0 to 26 degrees w/4 Positions. * (LH), 0 to 38 degrees w/5 Positions. * 0 to 26" Left, 0 to 28" Right. * 0 to 15 degrees Up or Down. 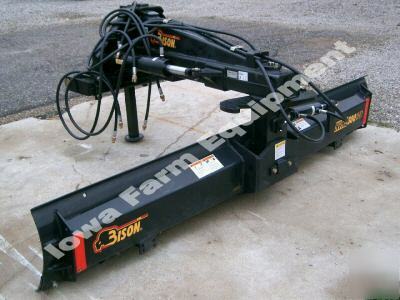 Photo Shown has 3-Hydraulic Cylinders & Hoses that are not included with this Blade. This Blade has ONLY the Manual Adjustments for the 3 Positions!